High-spec huts, basic eco lodges, some in the mountains, and some perched close to water bodies lapping up nature by rivers. Here are 7 perfect retreats for anyone who wants to be cut off from the world for a bit. Translating to “Blessing” this place is a treat to the eyes, mind and soul. Located in the Gyathang Village, in lower Dzongu this place is at an altitude of 5100 ft. Guests at this resort can enjoy a buffet breakfast, a well balanced picnic where the lunch will be cooked from the local produce, followed by a trip to hot springs. Pocket pinch for one person is INR 3,200. It’s an hour’s drive from Mangan and Kim. Nestled in the Silent Valleys of Maenam Sanctuary at Borong, Ravangla (a 130 km drive from Bagdogra / Siliguri and 85 kms from Gangtok), the retreat offers an excellent viewpoint for watching rare birds. An eco-friendly retreat, this place has beautiful mountain cottages within a two-acre wildflower garden. You can spend hours in the garden, take a lazy stroll down the village or go on jungle trails, or visit the Old Monastery, which a short walk away. And if you crave for a little adventure then you can take a hike to the waterfalls and hot springs in the Rangit River Valley. They don’t offer TV or WiFi, which is the best part because who can enjoy a trip being behind screens all day? The place gets frequented by photographers and bird lovers who visit from all over the world. Cost per head would be INR 2,500 to 5,000 depending on the kind of accommodation and services. Translating to the House of Happiness, this place is located in a river island called Majuli, Assam and has eight cottages which is made entirely of bamboo. One has to take a ferry ride of close to an hour to reach the river island. The food is excellent and local – a family kitchen close to the cottage provides food prepared from local produce, mainly Assamese and Mishing cuisine. Wash the food down with their two kinds of housemade beers – Poro (the sweet beer) and Nokjin (the sour one). La Maison’s caretaker, Monjit, gladly guides guest to local festivals and around local Mishing villages on request. Cost per person is INR 300, and INR 1,000 per cottage. You can e-mail Monjit at monjitrisong@yahoo.com or call him at 9957186356. 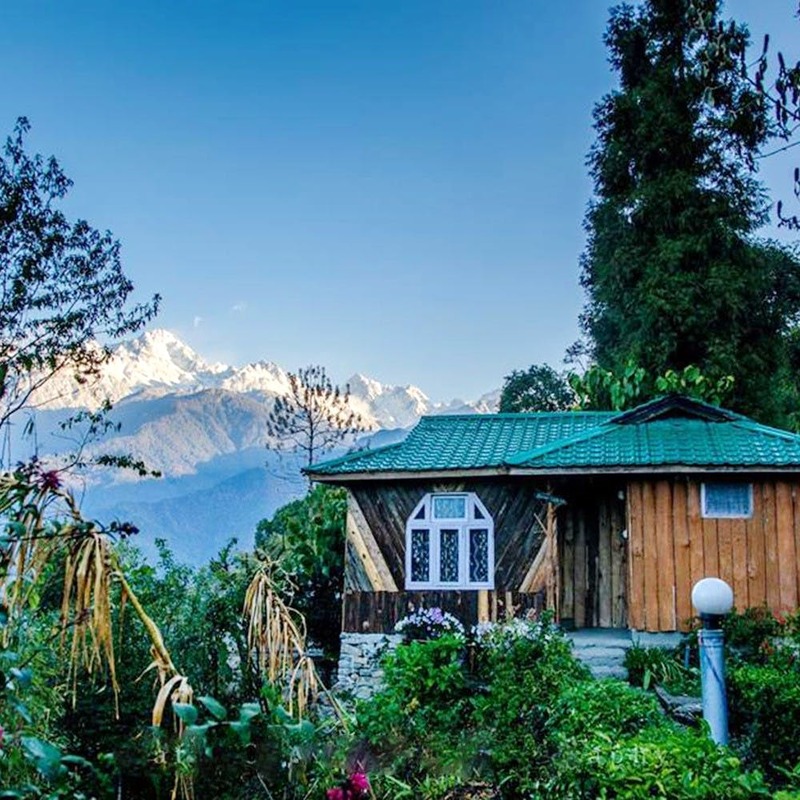 A scenic village near Gangtok (40 minute drive), this place is a getaway for offbeat travellers. It is a rustic cabin in a fully running farm with a view of mountains and an enchanting waterfall. Chill out and relax or choose from a variety of activities in the farm including organic farming, village walk, bird watching, BBQ and bonfires. And if you are into adventure sports, there’s a paragliding spot nearby. The cost per head for each night is INR 2,250. A UNESCO World Heritage site located in Gobardhana, Assam, the Manas National Park is a treat for people who are into jungle safaris. The park is known for its rare and endangered endemic wildlife. The Sikhri cottages face the perennial stream so you get to watch the animals who come down. A huge plus is the food prepared with local produce by the family which manages the resort. The pocket pinch will be around INR 2,500 – INR 6,000 depending on the kind of facilities you choose for your stay. Located in Mineral Spring, this is an organic village which is a scenic drive away from the town of Lebong. This place has a quite a few quaint huts and tents. The cabin is complete with electricity and en-suite bathrooms. The staff will prepare delectable delicacies for you with local produce from the farm. There’s lots to do here. You can opt for the day-long trek to Majitar, a small border village to Sikkim. Or a guided village walk or go fishing with the locals. Or you could hire a share taxi till Lebong and then hire a private car to reach the mineral springs here – it’s about a 3-hour journey. The cost per head for each night is INR 5,515 for a hut, INR 6,024.34 for a deluxe tent and INR 6,894 for a deluxe room. Call 97758 09299 or 99320 21569 for bookings and queries. Located in Tipam, one of the seven Tai Phake Villages in Dibrugarh district in Assam, this place is an unexplored paradise. Just getting here is an adventure – you have to cross the dense forest of Dehing Patkai Wildlife Sanctuary. You get to stay in bamboo cottages made bu villagers and it’s all pretty reasonable – INR 1,300 for dormitories and INR 3,200 for doubles (includes meals). There’s a Buddha Temple nearby and you can go on treks, fishing and boating on the river. Email at tpetc.tipam@gmail.com. Or call+918486843784.